Here is where nearly two million people died. Mostly my people. Most of my family. Here is where my uncle Oscar got the numbers on his arm. Here is all that is bad about the world, that such a place, such mechanized disposal of life, could exist. The ground here is still ash grey. 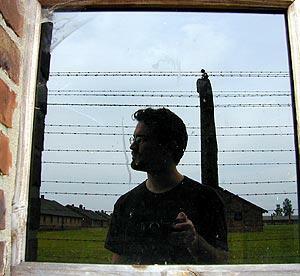 In the window of a guard building, on the other site of the barbed wire, on the freedom side, I saw myself in a reflection. I saw myself there. Then.